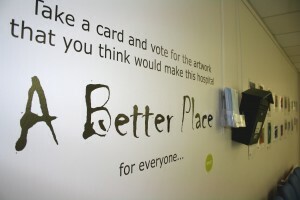 An amazing 49 artists submitted entries to A Better Place 2019, our annual exhibition which aims, through the display of original artworks, to make University Hospital Waterford (UHW) a better place for all: patients, visitors and staff. Each artist submitted images of two samples of their work. These are now on display on the ground floor long corridor at UHW, along with voting cards and a post box. Now it’s time for you to vote to decide which artist will be invited to present a full solo exhibition later this year. Artists are not identified, so you are voting simply on the basis of the work you see. Voting continues until 12 April, so don’t miss out – come and have your say!